This is a blog by Dhruv Sharma and Anna Henderson in the Office of the Chief Designer about making sure everyone can participate in design activities. The way we deliver government is changing. Governments redesigning services around the needs of users is just one very practical example of this. It seems ironic that, while design describes ways of engaging users in the development of products and services, in its current form, design often isn’t really inclusive or accessible. Be it our tools and techniques, outputs, outcomes or even our language, we could do better really. For a discipline that is championing the idea of designing products and services with, and not just for people, design has its own limitations that we need to be aware of. These activities aren’t always accessible. However design is extremely reflective, and therefore honest – a core value of our Civil Service Code. As design practitioners in the public sector, we need to redesign design to make it work for everyone, and to uphold its integrity. At the Scottish Government, we have taken some early steps to tackle this challenge. Our user-centred design community is working hard to introduce ways of making our events, workshops and other activities more accessible and inclusive. 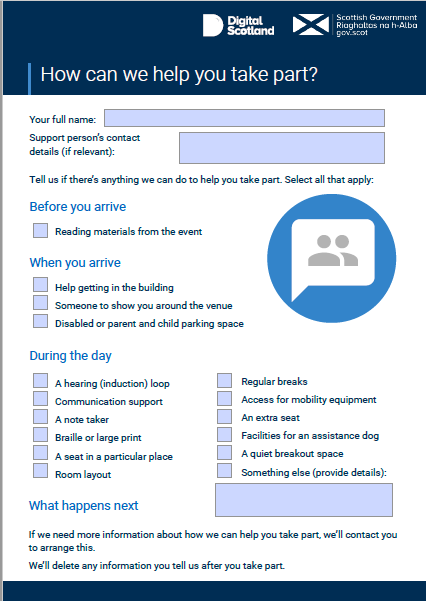 Through a user-centred design approach, we have developed an inclusion form which makes it easier for us to gather information about people’s needs when we engage with them, for example before, during, and after an event or a workshop. Testing this form has generally provided good feedback. We’ve also identified areas for improvement. In a recent workshop we realised that the form allows users to tell us what support they think they might need, without necessarily giving them enough information about what we would be asking them to do. Although this sounds simple, it can have massive implications on how we plan and run workshops. For example, depending on a colour-blind person’s exposure to, and familiarity with, design methods, they may or may not think they need additional support when joining a workshop. They may have been to workshops where flipcharts were used rather than using coloured post-its on a wall, and may base their response on their prior experience. Having observed some of these challenges when running workshops, we knew that we needed to do something about it. We agreed that we were not providing our attendees with enough information about what our workshops involve, so that they could imagine what challenges they may face, and be able to give us a better indication of how best to support them during our workshops. To help people think about this, we have created an ‘activities table’ that we are using along with our inclusion form. Although we are still testing and developing this, it has allowed us be clearer about what we are asking people to do, so that they can help us make sessions as inclusive and accessible as possible. 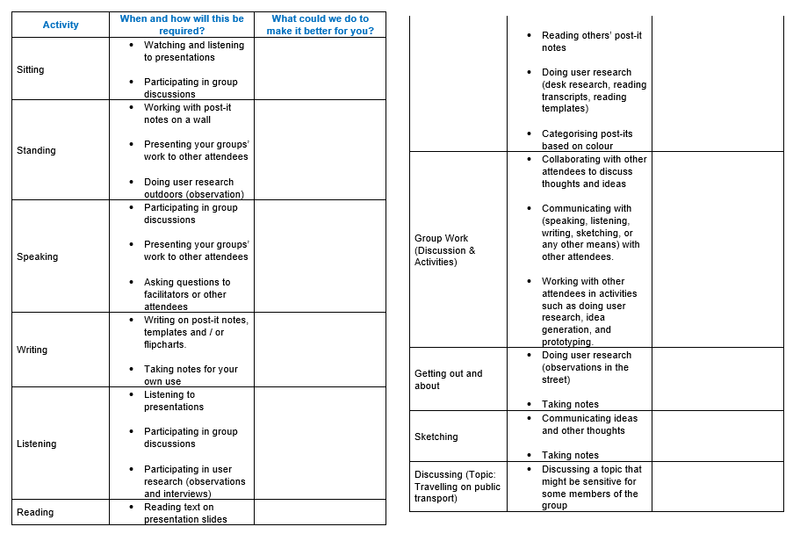 This is still work-in-progress and over the next few months we will be trying to find ways of improving our inclusion form and activities table. If you want to find out more, or have suggestions, please get in touch with us at the Office of the Chief Designer by emailing Design@Gov.Scot.